American Public Schools Once Again Infested By Islam. The infiltration and indoctrination of American school children is once again in the spotlight as the San Diego Unified School District partners with an organization whose mother is Hamas, and holds the status of un-indicted co-conspirator in the United States’ largest terror funding trial in history. The Council on America Islamic Relations (CAIR) is now dictating policy and curriculum standards for an entire school district. CAIR, lead by self proclaimed Hamas supporter Nihad Awad is also designated a terrorist organization with an American ally, the United Arab Emirates. (UAE). CAIR claims to be the largest civil rights group for Muslims in America, but most importantly Hamas’ most significant front group in North America is CAIR. That alone should be grounds for San Diego school officials to pull away. Read more about what Hamas and CAIR really are here.. In preparation for the following school years, the San Diego board of education has outlined their plan, regardless of parents rejecting many of its points of action. Prior to this, in November 2015, the board of education recognized CAIR for its community efforts. Yes, a school district is honoring a terrorist organization. Since many parents believe their children should be exposed to different religions, diversity and cultures, many see no problem with a group that stands for civil rights inserting itself on behalf of Muslim children. The first issue is, Islam is not just a religion, but a political way of life..a theocracy,with religion just being a small part. Under the auspices of a religion, groups such as CAIR have made enormous strides with protections under our first amendment, despite its political, and dictatorial ways. Putting that all aside, CAIR is Hamas, and Hamas is a terrorist organization. Issue number two should be the historical content of Islam that is portrayed completely inaccurately, with the portrayal of the prophet Muhammad as a peaceful, tolerant man when in fact he progressed as anything but. Do parents know Muhammad married a six year old girl named Aisha, and consummated the marriage upon her turning nine? A good Muslim must emulate the life of their beloved prophet, and they do not contest the age of Muhammad’s most favorite wife, thereby accepting what we call in America..pedophilia. All this accepted and promoted by CAIR/Hamas to your children. Another issue with the partnership between an American school district and a terrorist organization is the deception created by the Muslim community to make parents believe their children are participating in bullying and Islamophobia if they refrain from being friends or are intolerant of Muslim students. What’s absurd is an entire school district caving in to the whims of the Muslim community, with no thought or regard to how it will affect the majority of the districts non Muslim students. 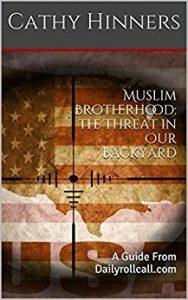 The formation of Muslim student clubs, is one of great concern, as the goal of CAIR/Hamas, and their sister organization, the Muslim Brotherhood have established from their inception, children are of utmost importance to cultivate, planting seeds in their minds that Islam is the only true way of life and that schools should be fertile grounds. The bottom line is CAIR/Hamas is a terrorist organization run by individuals with the ideology Islam is superior and Sharia law must be the law of the land. What the San Diego Unified School District has done, is guaranteed Islamic law be followed in public schools no matter how low the population of Muslim students attending is. This is only the foot in the door. If parents in San Diego are comfortable with men who believe pedophilia is ok, making the rules for your children, you are throwing your children to the wolves. Message to parents with children in public schools across America: This is what is occurring in the San Diego Unified school district, and will, without doubt follow in other schools across the country. While the teaching of the basic tenets of Islam may be acceptable, only you can stop the indoctrination of your children. Accepting textbooks that glorify the prophet Muhammad rather than the truth and allowing intrusive accommodations, that no other religions have been granted is dangerous, and against American values and culture. CAIR and their warped ideology is headed to your school district. If you value your children, take a stand. Next → Next post: Nashville Muslim Activist Declares Time to Stop Hiding Behind Patriotism and Religion.